"Influencer marketing" remains all the rage, but the brands achieving real bottom-line results are those that put in the effort to identify the people their customers trust. These brands are finding that "micro-influencers" drive more action among their target audiences than celebrities are, and micro-influencers have a higher level of engagement with their followers. Micro-influencer engagement rates are 60% higher than traditional influencers'. Their campaigns are 6.7 times more efficient per engagement than influencers with larger followings. Micro-influencers drive 22.2 times more weekly conversations than the average consumer. Brands in search of influencers, then, would do well to consider micro-influencers, even though they might have fewer followers. An interest in influencer marketing is a start, but you won't get far unless you find the right influencers to partner with, according to Amisha Gandhi, vice-president of influencer marketing at supply chain software company SAP Ariba. Amisha encourages her team to look deeper than follower counts. "Popularity and influence are not the same thing," Amisha emphasizes. I invited her to Marketing Smarts to talk about how influencers can engage a brand's audience more effectively than traditional celebrities, creating deeper customer connections. Influencer marketing works for B2B brands, too (07:00): "When you think about B2C, like the Dove Real Women campaign, they brought in some real women who were influencers. That's really easy to understand, because there can be an immediate buy. Whereas in the B2B world, the customer journey is much longer. So when you think about influencer marketing, you think about the awareness stage, which could be events and blogs and other things with influencers where you get social media impressions and some coverage. "Then you start thinking about other pieces of the customer journey where you could bring the practice of influencer marketing and the different communities of influencers in. For lead gen, you could do activities and create something really high-value with influencers that people are willing to give some information for. "A lot of [influencers] have their own newsletters and their own communities where you can tap into that and they're the voice. They're not talking about SAP Ariba the product: They're talking about issues in the industry and bringing us in that way. It's much more authentic and engaging to our end audience. That's lead gen and demand gen."
Assemble the right crew of influencers and encourage them to team up (12:49): "They all know each other. They show up to the same events. They have some camaraderie and they do share. Good influencers share with others. It's a two-way relationship. You're not looking to say 'come and do this for me.' You can do that and it becomes very transactional. What you want to do [instead] is find the right people. "The key to any good campaign or any good influencer program is that what you're doing isn't as important as who you're doing it with. Find out who their audience is. There are tools like Traackr out there you can do that with. Some people use Sprinklr and some other things. If you're a smaller company, you can do that with Google, because there's a lot of lists out there. But you have to do the legwork yourself. Part of it is automated, but part of it is manual. Then it comes down to the conversations you have. "Be really honest with your influencers about what you're trying to do.... Oftentimes they'll give you good feedback on your program and say, 'Hey, did you think about this' or, 'If you want to get more pop, you should do it this way.' They're really good about sharing, but you also have to highlight what you're trying to do and what's in it for them." Figure out what you're trying to accomplish, then reach out to relevant influencers for their feedback (24:50): "The first thing you want to do with your influencer marketing program is really start the right relationships for your brand or your company or your product line, topic area, whatever. Have a clear point of view, know what your business outcome is, know who the audience you're trying to reach is, and then start having the conversations. Then you can come back and say, 'OK, based on the audience we're trying to reach and the business outcome we want, here's the campaign we should do based on these conversations and feedback from these influencers.'" To learn more, visit Ariba.com or follow the company on Twitter: @SAPAriba. You can also follow Amisha on Twitter: @AmishaGandhi. Amisha and I talked about much more, so be sure to listen to the entire show, which you can do above, or download the mp3 and listen at your convenience. Of course, you can also subscribe to the Marketing Smarts podcast in iTunes or via RSS and never miss an episode! GoToWebinar makes it easy to produce engaging online events. Whether you want to connect with your prospects, customers or employees, GoToWebinar has the tools and analytics you need. Start creating interactive and educational webinars your audience will love. Amisha Gandhi, vice-president of influencer marketing at source-to-pay procurement and supply chain software company SAP Ariba. To learn more, follow Amisha and SAP Ariba on Twitter at @AmishaGandhi and @SAPAriba, respectively. 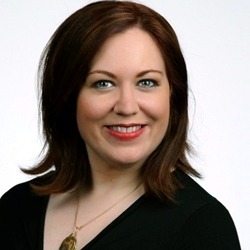 Kerry O'Shea Gorgone is a lawyer, podcaster, speaker, and writer. As director of product strategy, Training, she oversees sale and distribution of MarketingProfs' premium training products. Kerry also hosts the weekly interview show Marketing Smarts. To contact her regarding podcasts, send an email to podcasts@marketingprofs.com.